The jewellery firm of Lacloche Frères was founded in 1875 in Madrid, Spain by a family of four brothers: Fernand, Jacques, Jules and Leopold Lacloche. In 1892 the firm moved to Paris, taking up a shop on the Avenue de l'Opera, where they competed among the top jewellers, including Cartier, Boucheron and Van Cleef and Arpels. In these early years in Paris Lacloche produced jewellery in the reigning Belle Époque style, of which this ring is a rare and exceptional example. 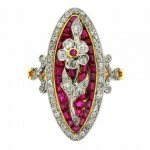 The ring exhibits all the hallmarks of this high style, including delicate floral motif, openwork scrolls and elongated bezel, all executed in platinum topped yellow gold and a two-tone gemstone combination; the latter element was most often comprised of diamonds with one other precious coloured gem, typically ruby, sapphire or emerald. Pieces made by the firm are recognizable for the intricacy of craftsmanship, this being no exception, as exemplified by the fine pavé setting of the calibré-cut rubies, which was a new technique introduced around this time. Few early Lacloche pieces are seen today, and fewer still rings, making this, in conjunction with the outstanding quality of the work, a collector's item. It is truly an example of the crème de la crème of French Belle Époque jewellery.